This book was a blast to listen to and to experience. This is a crazy little story which sets up tons of funny and entertaining scenes that are the real stars of this book. The humor, character interactions and great narration are what make this a really enjoyable listening experience. The humor is off the wall just like some of the crazy scenarios that play out, and it hit the right notes for me. The narration by Jeffrey Kafer, Emily Woo Zeller, and Machelle Williams is really great and I thought they all did an incredible job. 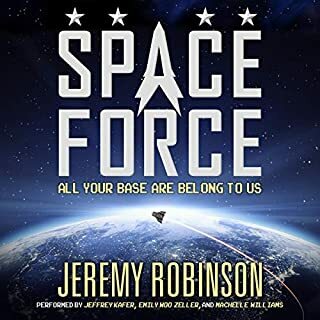 I am familiar with Jeffrey Kafer and thoroughly enjoy his work, but I thought Emily Zeller and Machelle Williams brought a great dynamic to the collaboration and made for an entertaining and enjoyable experience. I would recommend the book just for the narration, let alone the characters and book itself. Overall it is a fun sci-fi crazy land filled with nutty characters and scenes, and all narrated excellently. Had never read anything by this author before or knew anything about this series before going into it and had an absolute blast. 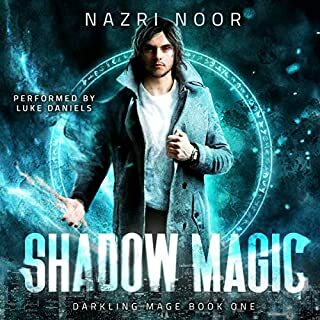 Tipping my toe back into urban fantasy again with these stories fun characters and the great world was a great time. It touches on plenty of things that are familiar but makes them its own and had an exciting pace that kept me listening throughout. The narration by Luke Daniels is of course amazing. He has a great range of voices and great timing and pacing and really brings this book to life. A great world with an entertaining main character makes me look forward to more from this series. 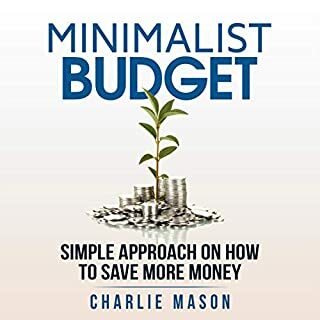 Filled with so many ideas in spending, money management, investing, and so much more, this book will give you insights on how you can spend less, save more, and grow your money. This book will help change the way you handle money, finances, and expenses. It will also teach you about the many different ways you can manage your spending, so you don’t end up in debt. The processes and ideas contained in this book are proven effective in keeping your expenses low while keeping your income high. Very informative and helpful for a short listen. This is a short and informative little read with some good tips to help get your budget going the direction you want it to. It tackles some practical tips, habits and general things you can apply to help with your spending and managing your spending. It also points out some common things people tend to do that messes up your day to day spending and can give you some general ideas on how to proceed. The narration by David Miller is decent but has some background issues and some may be less than enthusiastic reading at times. Overall it is a good intro to getting control of your budget and provides some good information. This book was given to me for free at my request and I provided this review voluntarily. 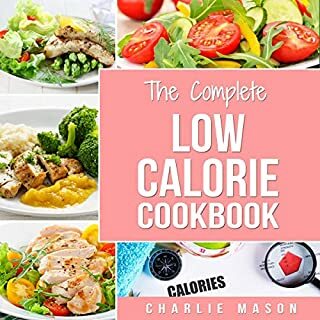 This cookbook is loaded with a variety of delicious, low-calorie meals and treats that are easy to make and less than 300 calories per serving! If you are ready to be healthier, feel better, and be more energized to do everything you want to do in life, then this low-calorie cookbook is your ticket to a better way of life! This is convenient and easy to follow book of low-calorie recipes. It has some pretty good tasting meals for anyone looking to cut some calories from their daily meals. Easy to follow and listen to while you prep and cook the meals, they are a good choice to keep your hands clear of anything you need to read while you do your work. The narration is solid and gets everything across clearly and at a good pace that you can follow while cooking. This guide not only provides you with some tasty and delicious recipes your family will beg for again and again, it also comes with healthy meals, those that would help you stay low carb, vegetarian, Paleo, and so much more. 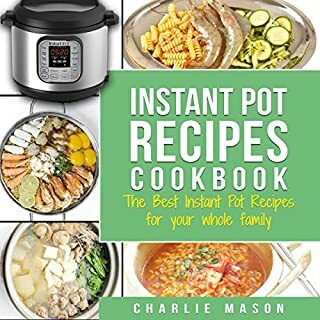 I have been using my instant pot for primarily cooking rice the last few years and thought I would dabble in some recipes for it. This book has a lot of easy to follow and great tasting recipes that are quickly made and easily prepared. The narration is very clear and easy to follow, describing everything so that you can prep while listening. I like these audio cookbooks because they give me ideas without having to sift through recipes myself and allow me to cook while I listen. Smoothies are an amazing creation with the power to provide a variety of ingredients that are good for you all in one delicious concoction. If you are looking to lose weight, get a better boost of energy that lasts longer, are eager for more radiant skin, or just seeking an easy way to consume your fruits and veggies, then this audiobook is just the right fit for you! 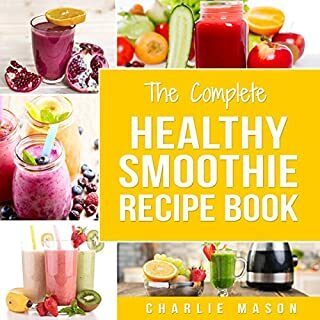 Once or twice a week I will make a smoothie in the morning and had generally always made some variant of the same kind onf shake, and was looking to see if this book would give me some other ideas. It definitely provided me with some other great tasting shakes, but it also had some that contain dietary things that I wasn't putting into my shakes to being with. They were all easy to prep for and make, and turned out pretty well; I will be using some of them regularly. Any vessel that can get me fruits, vegetables and other nutrients that tastes good is golden in my book. By purchasing The Complete Air Fryer Recipes for Quick and Healthy Meals, you will soon be surprised how simple it really is to serve meals to your family that not only taste superb, but will also improve your general health. Having gotten an air fryer a few years back and never making anything more than french fries or some chicken in it, this cookbook seemed like a great thing to just get some ideas from. Although you can look up a recipe for pretty much anything nowadays if you aren't sure what to look up for an air fryer this was a great resource to grab some dishes from. I enjoyed the chicken kiev and the roasted carrots, and plan to try quite a few more in the book over time. The narration is okay but has some background noises and such, but I supposed those don't really matter for a cookbook that you will probably have on in the background while prepping the food. 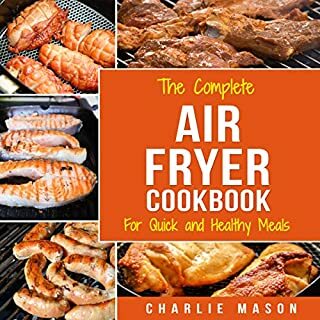 A good little cookbook for anyone that owns an air fryer. This soup recipe cookbook not only includes a wide variety of soup recipes that will leave you feeling satisfied, but it was also based on a shared goal that most everyone strives for: better health in half the time! Soup’s on! Step up your souping skills! Having never made any soup beyond a chicken noodle, I thought this would be an interesting experiment for me to entertain. I found actually quite a few that I enjoyed both preparing and obviously consuming. 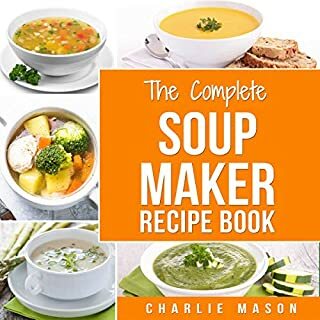 The whole soup making process is a lot simpler than I had thought, and this book lays out how to make quite a few. The narration by Betty Johnson is overall pretty good, although there was some background noise here and there for me, that doesn't really matter in a cookbook. No matter, if you are pressed for time or materials soup, is something I can enjoy, and this book has some great ones. If you feel like you've waited too long to start planning your retirement strategy, or are overwhelmed by where to start, then keep reading... Preparing for retirement can feel overwhelming, particularly when it comes to investment strategies. 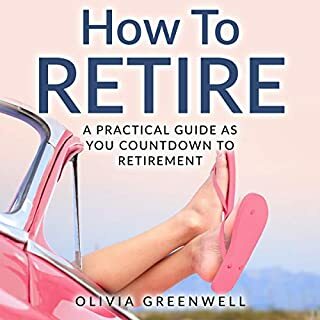 Olivia Greenwell's latest book tackles those difficult issues which often intimidate people the most, outlining clear steps to take for a smooth and successful retirement journey. This contains some great practical advice to help you start planning your retirement or get an idea of what is needed to do so. In such a relatively short book, we are getting an outline or general starting point to help build upon and gather momentum in the goal that is a healthy retirement. I think it is full of useful advice and pair that with a more in-depth financial look at what is involved (which is suggested in the book) and I think it lays a good foundation. The narration is solid and well delivered by Julie Slater and kept me engaged throughout. Thought it was an engaging and positive book on what many dread or fear. 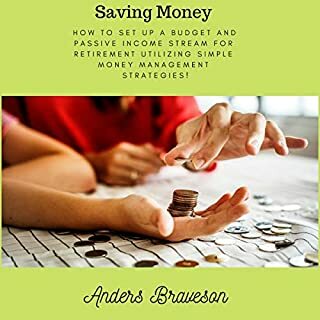 Saving Money: How to Set Up a Budget and Passive Income Stream for Retirement Utilizing Simple Money Management Strategies! A job is the common means to make a living, but there are other ways where you can have more satisfaction and enjoy an awesome lifestyle together with your loved ones without sacrificing much! We are living in the information age. Don't let the opportunities it offers go in vain while millions of other people are enjoying their lives. This is a great little book that introduces and helps get you going with saving money, paying off debts and preparing for the future. It is book one in what seems to be a series on saving and procuring money to ensure a healthy future. As far as being a little starting book it is short and concise, with solid information. It isn't jam-packed with information, but it has a good amount for the half hour it takes to blast through it. The narration is solid and brings all the information across clearly and at a good pace.